There's a section of The Hitchhiker's Guide To The Galaxy by Douglas Adams that explains how "space is big. Like really big." So it is that this passage from the Book in the adventures of Arthur Dent and Ford Prefect is called to mind when firing up Hello Games' No Man's Sky, one of the most anticipated titles of the year. With its promise of almost 19 quintillion planets to explore and a universe out there waiting for you, it's no wonder that many were salivating at the thought of this deep-space wandering. But it's interesting to note that No Man's Sky may not satiate everyone's desires to see the universe, and may even leave some feeling ambivalent in what occurs in this AI generated universe. Initially, you find yourself dumped on a planet, with your ship slightly in tatters and your equipment needing an upgrade and serious repair before you can even head off into the stars. Your only tool to help with such a thing is a mining gun that helps you take out elements from the world around you so that you can craft your way off the rock. But, as you go around blasting resources and claiming them as your own, you have to be careful as flying sentinels circle your every move, and will attack if you're being greedy. 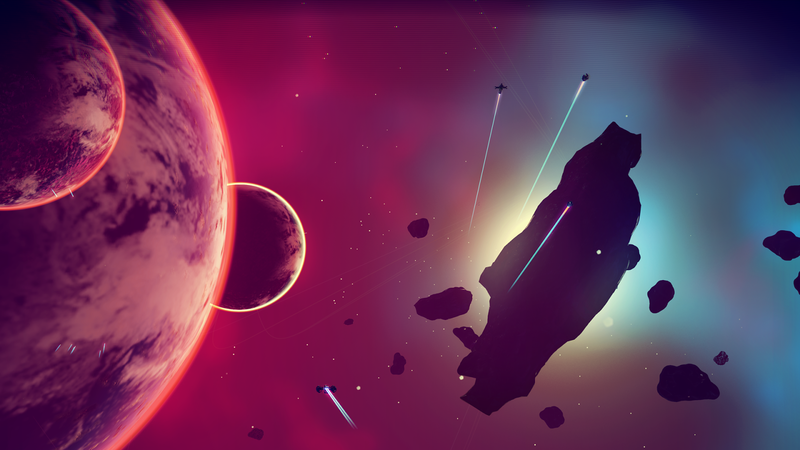 There's a line to tread between altruism and avarice in No Man's Sky, and how you decide to do it will define your game. No Man's Sky is epic and lonely but a deeply spiritual experience. Mixing in elements of BBC computer game Elite with Destiny's UI, No Man's Sky is an interesting game that will give you as much as you're willing to give into it. Hopping planets in systems and scanning everything as you go will take patience and won't be for everyone; meeting new animals and scanning them gives you money, feeding them makes them happy - and gives you nothing except a warm feeling in your spacesuit. Exploring a planet will show off new terrain, full of flora and fauna and occasionally monoliths and educational plinths that give you insight into the language. 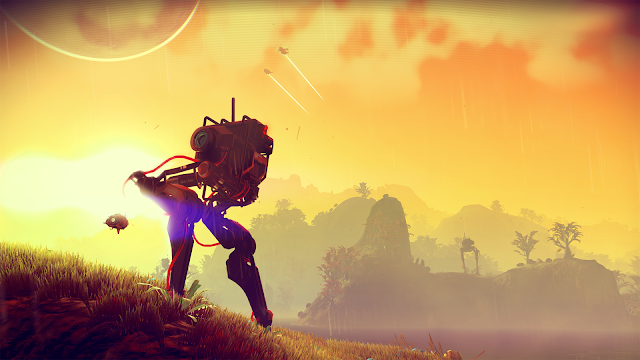 Yes, No Man's Sky is that kind of game - a sort of space set hippy-dippy dive into 2001: A Space Odyssey territory. If you want to see things around, then you can. But there's no obligation to catalogue everything on the worlds and outside of mining resources to get you what you need to get back into space and head into the centre of the universe, it's unclear what the game aspires to definitively other than to provoke a sense of wonder. There's a side story involving the history of the universe that adds a portentous mythical depth to proceedings and which helps you understand the world you live in. It also aids trading partners and your standing with aliens if you partake and it's been nothing but beneficial so far. Trading and meeting aliens within space stations is all part of the game as well. Unlike Elite's desire to have you listen to the Blue Danube, docking is all automatic and landing all taken care of. This is not a game that relies on fiddly mechanics to fly and a lot of the game will require you to do so - yet, for all the time you spend in space, alone, there's little when leaping from one to the next to do except simply sit back and watch it happen. It's a confused experience, yet bizarrely one that gets the mundanity of space travel spot on. It's a game that has an inherent spirituality in between its peaks and its troughs - and yet despite all that, it feels slightly alone in the cosmos. And alone is the right word; this is not a game that allows you yet to meet others. Which is something personally that is preferable. The idea of others intruding on your own journey is not one to be relished and thankfully, No Man's Sky's insistence on being solo is also one of its strengths. You interact with game generated creatures and ships, but no one else. It's a commendable ethos and a single minded purpose for such a game given how people's desire to "clock" a space game and then irritate people can ruin an experience. From trading and grinding, to revisiting the scene of your death to re-claim all of your gear (the game operates on a Dark souls death experience that needs you to go back to where you died), there's more than enough to keep you occupied. 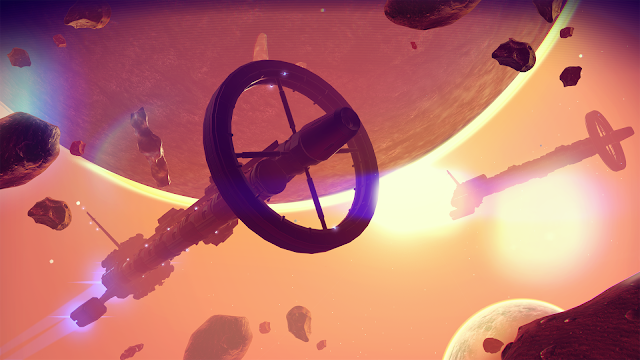 With Hello Games' plan to release free DLC, it appears there is more on the horizon too. At the end of the day, No Man's Sky is an experience - though quite why it was not held back for VR is beyond comprehension as its gameplay could have blown minds. It's a game that requires a grind and requires patience as you negotiate the worlds out there, chart uncharted waters and worlds and meet and greet the aliens. It's about you - and it's about what you put into it of yourself. And yet, despite all of that, for pure escapism and for pure creativity, No Man's Sky achieves and exceeds expectations. It's about rhythms of life, and of going with the flow - and currently, the gentle mood and just being out there is personally speaking to the gamers. It's just that whether that pull to keep on travelling and keep on cataloguing will still hold as strong in a couple of months' time remains to be seen. For now though, I'm sold.